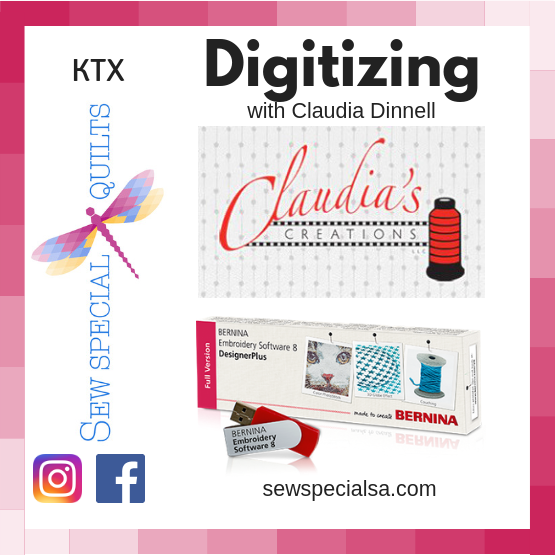 Claudia Dinnell will be teaching a digitizing class at Sew Special on October 31, 2018. Her class will bring BERNINA V8 enthusiasts up to date on all of her current digitizing techniques. She has assured us she will have new tips and tricks not taught in previous workshops. Class will start at 9:30 and end at 3:30. Please bring a mouse to this class. Please bring a mouse even if you usually don’t use one. Please bring an extra battery for the mouse. Please test out the mouse at home to make sure it works with your computer!! Digitizing is much easier and faster with a mouse than the built-in pad on a computer. Please bring a good mouse pad!! One that works with your mouse! Cushion for the chair if needed for the height.